Cruise and see many miles of Assateague where wild ponies live. The Chincoteauge Wild Pony Auction is usually held on the last Thursday of July, the day after the pony swim. This is the day when some of Assateague's wild ponies are auctioned off by the Chincoteague Volunteer Fire Co. During the auction, yearlings and younger ponies will be sold. Anyone can participate in the pony auction. No registration is needed for attending the auction. Just raise your hand during the autioneer's chanting in order to make your bid. Every year about half a dozen foals are donated back and released on Assateague Island. These young ponies can purchased by someone and then returned to Assateague Island to spend their lives with the other 300 wild ponies on Assateague. Wild ponies that are returned to Assateague Island provide good genes that benefit the existing herd. Buyers of these foals are photographed with their ponies and receive a registration. The Chincoteague Volunteer Fire Dept. began to hold the pony swim, auction and carnival in 1925. At the carnival, approx. 70 yearlings and younger ones are auctioned off. The unsold (adult ponies) will swim back to their home, Assateague Island the next day. The tradition began when the town of Chincoteague needed fire equipment in order to protect itself from local fires. Marguerite Henry's famous children's novel "Misty of Chincoteague" has reached millions of visitors with an interest in wild ponies. Visitors now travel to Chincoteague and Assateague to see the islands that Misty and the other wild ponies have made famous. "Misty of Chincoteague" tells a true story of a young brother and sister (Paul and Maureen) that grew up on Chincoteague Island during the 1950's. They wanted to attend the pony swim event and purchase the Assateague wild pony they had seen roaming free on Assateague Island. The children raised money to buy Misty by doing odd jobs in town. One way they raised money was by harvesting clams and selling them to Burton's Seafood (A Chincoteauge Island seafood business). Since the "Misty" book and pony auctions, many children as well as adults all over the world have dreamed of buying and owning an Assateague/Chincoteague pony. The real life wild pony named Misty was unique because she had a marking on her side resembling a map of the United States. Today, the Chincoteague Wild Pony Auction is your chance to possibly own one of Misty's decedents.  A horse trailer for your new foal is needed and must be approved by the pony committee.  For payments, the Fire Department will take only Visa, Mastercard, or Cash (and will not accept checks). 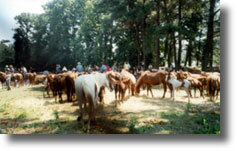  Registration of ponies purchased at auction is required. The annual pony swim and auction helps to manage the number of wild horses on Assateague and prevents them from adversely impacting this sensitive barrier island ecology.